In an era of growing interest in developing solutions to homelessness, it is increasingly important to know what works, why it works and for whom it works. While there is a growing body of academic research on the causes and conditions of homelessness, there is very little research that describes effective interventions in a practical way that helps communities learn from and adapt these initiatives to local contexts. Many communities and service providers in the non-profit sector lack effective tools, resources and capacity to engage in rigorous program evaluation or to disseminate knowledge learned in order to assist service providers and program planners elsewhere. The notion of ‘promising practices’ is about communication; that is to say, alerting those working in the field to a strategy that demonstrates positive results. 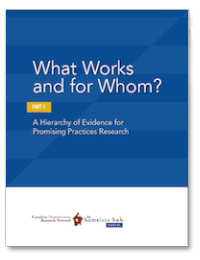 To that end, the Canadian Homelessness Research Network (CHRN) developed a framework to identify and share promising practices in order to support communities in the development of effective programmatic solutions to homelessness in Canada. It is our view that we must begin to understand the effectiveness of our approaches and invest in efforts that have been demonstrated to be effective and hold potential for replication and adaptation. It is essential that we use evaluation and research to generate evidence on promising practices, as well as those that have the potential to be effective.